The prompt this week in the Documented Life Project - The Journal is The Color Wheel. I was away last weekend and this week I've been a bit tired so I haven't been in my studio. I spent the time thinking about how I might do this page. I thought about using old wagon wheels in different colors. Then I thought about tires in color. 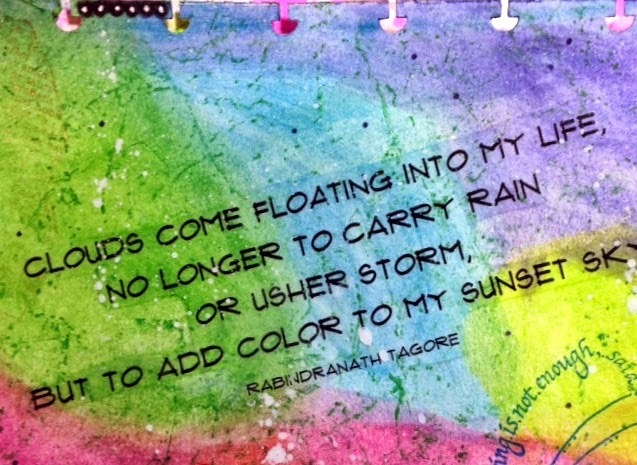 Next I researched quotes about color. This is way more thinking than I usually do for a journal page. LOL. After all that.... when I sat at my table what came to me was.... Use those yummy Derwent Inktense Blocks... So many pretty colors. I bought these last September. Amazon had a fantastic deal...$53.87.. now they are $101.99 which is still $100 off of retail. I really like Derwent Inktense products. I also have the Inktense pencils. What I like about them is that they are very vibrant and can be moved around with water. When they dry they become permanent which is my number one requirement for my art journal. My watercolor friends laugh because my first question is "Is that color waterproof?" So after all that thought, I went with scribbling circles of color all over my page. I spread the color with a baby wipe. I let it dry and then added more color because I wanted it very vibrant. Next I used Emerald Archival Ink to stamp a Just For Fun crackle stamp background. I've had the stamp at least 15 years. It is one of my favorites. I also stamped the dragonfly with definition in Monarch Orange Archival Ink by Ranger. I can't remember who made that stamp. I have a collection of winged critter stamps. The side view butterfly is another from my collection. It's unmounted and I don't know who made it either. The tiny dragonflies are from The Angel Company. All of these stamps have been in my stash for a very long time. I realize now it would have been helpful if I'd kept the names of all the companies who made them. When I bought them, it never occurred to me that I would one day be writing a blog or art journaling. I have been practicing the splatter technique and I'm finding practice does help. I like how these turned out. They were made with watered gesso and a round brush that tapped on my finger. The quote at the top is a packing tape/laser copy transfer. (sorry the photo's are missing on the link but the directions are there). I found the quote on Brainyquote. I composed the quote at the bottom. It's also printed with a laser printer and colored with Yellow Inktense. 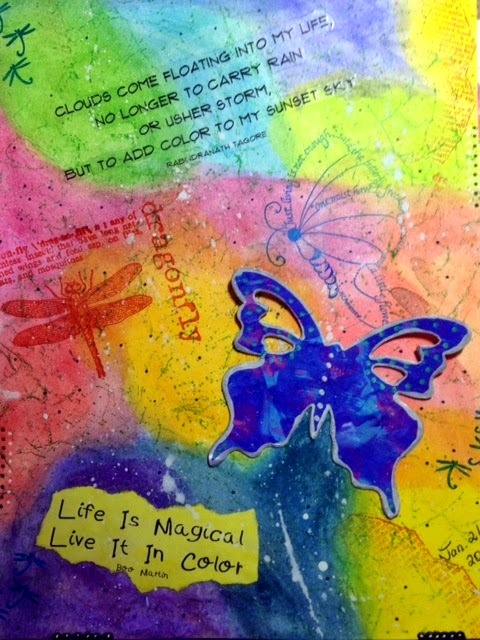 The butterfly is a Sizzix die cut from a Gelli print. He is outlined with a silver Oil based Sharpie Paint Pen. I really don't like it when I'm so tried that I don't get to the studio. Creating this page energized me. Color usually does that for me. So pretty, I love the vibrancy of the colors! Your page looks wonderful! I love the colors and how you put everything together. And I smiled when I read how you spent your time thinking about how to do the page. I love the documented life project and I also did some pages and I'm currently also spending my time thinking about how I could create a page with the color wheel prompt :) I'm looking forward to your next pages! This page looks really marvellous. Glorious, intense Inktense. I love my Inktense too Boo, for that vibrant colour that is difficult to get elsewhere, especially waterproof too, lol. Beautiful page and I love the quotes you used too. Wonderful colors. Love your page. :) Have a great day. Wow, beautiful! I love the cut out and stamping, looks so fun!!! Those are lovely!! You may need to watch out for the Inktense products, though - I've heard that the colors fade quickly even if they aren't exposed to light! But really, playing with color is the important thing, not making it last for 500 years :) Happy PPF! the colors are intense and so vibrant-love them, along with your page! I have stamps that are very old too-and some of them never had a manufacturer name on them. Glad you finally got some time and energy to create and play! Oh so beautiful! I'm with you, colour energizes me too!! I'm going to look into those intense colours! So pretty and I love those intense colors! These turned out so well, I love your splatter! So bright and vibrant. And I love the quote. Lovely piece!